Jobu discusses some options for the left side of the Yankees infield in 2014. It’s no secret that the Yankees are in for a lot of changes this off-season. So far, we’ve covered what they might do at catcher, with at least one rotation spot and even some of their outfield, but we haven’t yet really touched upon the infield, where they might end up needing the most help of all. They may or may not have a third baseman at all depending on the whole Alex Rodriguez situation, and can they really count on Derek Jeter to stay healthy all year? There’s a real possibility that the Yankees will have to replace the entire left side of their infield at some point this year, so let’s see how they might be able to do it. I am actually very intrigued by Jhonny Peralta. Very intrigued indeed (insert chin stroke here)… Peralta spent the last four seasons as a Detroit Tiger, but it seems that he’ll have to hit free agency because he’s a man without a position in MoTown. Peralta can play 3B or SS. Detroit has Miguel Cabrera at the former, and they acquired Jose Iglesias from the Red Sox this year to man short while Peralta served his Biogenesis related suspension. Peralta has toyed with the idea of moving to the outfield in order to stay on the Tigers, but they’re pretty full in the outfield too, with Torii Hunter, Austin Jackson and super prospect Nick Castellanos pretty much entrenched at the three spots. They also can’t move Cabrera to DH full time because they have Victor Martinez playing there. It’s definitely time for Peralta to move on. It’s pretty obvious how Peralta fits into the Yankees 2014 roster. Peralta has the experience to fill in, or take over, both spots on the left side of the infield. Not only that, but he’s a great defender, one of the better ones on the market. When you add his bat into the mix, he becomes even more attractive. Peralta enjoyed one of his better offensive seasons in 2013, putting up a slash line of .303/.358/.457 with 41 extra-base hits and 55 RBI in just 107 games before his suspension. Peralta also put on an impressive performance in the playoffs this year, and is a career .283 hitter with 8 homers in 45 post-season games. The man can play ball. At age 31, the 11-year Major League veteran would immediately be the best overall shortstop on the Yankees (even if Jeter hits like he did in 2012, which he probably won’t), and he’s miles ahead of the team’s next best third baseman after ARod (seriously, do you want Nix playing every day again?). Peralta’s last contract was the two-year, $11.25 MM deal he signed with Detroit after the 2010 season (the club also had a $6MM option for 2013 that they picked up). Normally, after sandwiching one off year between two pretty terrific offensive and defensive seasons, in a relatively weak market, you’d think he’d be due a raise, especially at his relatively young age. However, it’s hard to tell what his value is because of the Biogenesis suspension. Were his dealings with Biogenesis the only reason behind his resurrection in 2013? Nobody really knows with these guys. Melky Cabrera signed a two-year $16MM deal with the Blue Jays after his suspension, and then he was just plain awful this year before succumbing to injury. I don’t think the Yankees will be able to get him for super cheap, especially if they can’t guarantee him every day playing time at one position (what if ARod only gets 50 games and Jeter stays healthy?). However, I think the Biogenesis guys should have to prove something to MLB teams rather than immediately being rewarded with large contracts. I think the Yankees should offer Peralta a three or four year deal at relatively close to market value (whatever that’s going to be). The fact of the matter is that the Yankees do not have anyone knocking on the door from AAA trying to fill the shortstop hole. I think I’m about done with the Eduardo Nunez experiment, and no other internal candidate is even in the neighborhood. If the Yankees can’t get Peralta, they could always try to get Stephen Drew again. Again, you say? During the 2012 off-season, the Yankees knew they needed some help on the left side because ARod was coming back from his hip surgery. They tried to lure Drew in to play 3B, but the career SS wasn’t interested. Instead, he signed with the Red Sox and won a World Series… smart choice. However, like Peralta, Drew will most likely not be welcomed back by his current team. Also like Peralta, it’s not because of anything he did wrong. The Red Sox are ready to hand the left side reigns to Will Middlebrooks and stud prospect Xander Boegarts. While Middlebrooks struggled mightily at the beginning of the 2013 season, he eventually settled in and looked as good as he did during his 2012 call up. Boegarts is one of those can’t miss guys, and he looks to be the real deal too. Drew was a pretty important piece of the Red Sox World Series run in 2013. Like Peralta, he’s one of the better defensive shortstops on the market. While Peralta’s bat is much better, Drew isn’t exactly a slouch either. In 124 games with the Sox this past season, Drew slashed .253/.333/.443 and slugged 50 extra-base hits to boot. Drew has a little less raw power compared to Peralta, but he has a step or two on him on the base paths (compare 8 triples to 0). Drew is a year younger than Peralta, and has three less years of accumulated service time, but I do feel he has a little more mileage on him than does Jhonny. The 124 games Drew played this year were the most he’s been able to play since 2010. He’s been plagued by injuries over the last few seasons, starting with a broken ankle back in 2011. That injury caused him to miss about a calendar year, and he didn’t make it back until late June of 2012. This past season he missed time with a concussion in the spring and a hamstring issue in late June. Does one bad injury and some minor ones mean he’s injury prone? That’s hard to say, but we all remember his brother’s extensive list of injuries, so I would keep any contract offers down to one or two years for Stephen. There are a few options on the free agent market if the Yankees want a typical veteran middle infielder, but the corner infield market is a little less supple. The Yankees could do something like bring back Mark Reynolds to play third base and hang onto Brendan Ryan in case Jeter gets hurt, which is an option we already discussed in a previous installment of Tough Decisions. They could also go out and get veterans like Clint Barmes, who is entering free agency after two years in Pittsburg, a guy like Yunel Escobar if his option isn’t picked up by Tampa Bay or even bring back a familiar face like Eric Chavez, but I don’t think any of those scenarios is ideal. Barmes might be the best option of the bunch as he is a plus defender, but Chavez can’t be counted on to last a full season and I just hate Escobar so I don’t want him on the team (did I just guarantee that the Yankees will sign him if he’s available?). There might be some trade options too, as the Yankees are apparently still in love with Chase Headley for some reason. 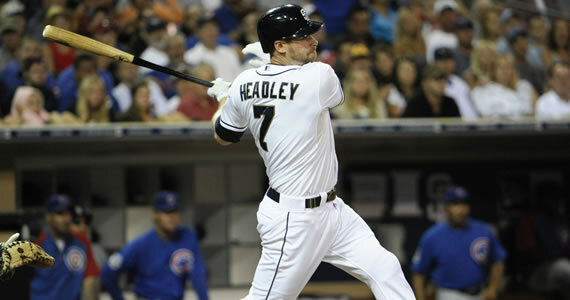 Headley had a majorly disappointing season last year after breaking out completely in 2012. His value might be down because of that bad year though, so that could be a worthwhile option for the short term (Headley goes free at the end of 2014).